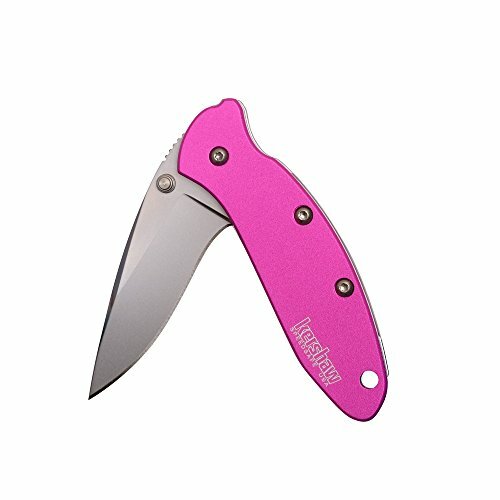 Kershaw’s handy little Chive is now pretty in pink. The Chive’s 1.9-inch blade is perfect for carrying in a pocket, purse, backpack, bag, jacket or briefcase for easy access. Not to be underestimated, the Chive’s small stature does not hinder this excellent tool from tackling a wide variety of tasks including opening packages, slicing duct tape, removing splinters and stripping wire. The Chive’s blade is made with high-performance 420HC steel for superior hardness, corrosion resistance and edge retention. The anodized aluminum handle is bonded in stunning, jewel-tone pink for a highly fade and scratch resistant finish. The SpeedSafe assisted opening system, allows quick, ambidextrous, one-hand operation while the Chive’s liner lock secures the blade open during use, and a sliding tip-lock keeps the blade closed during safe carry. American made by skilled Kershaw knifemakers in Tualatin, Oregon, the Chive is dressed to impress with its compact build and quality performance.